Preliminary Chart of Entrance to Koos Bay Oregon. 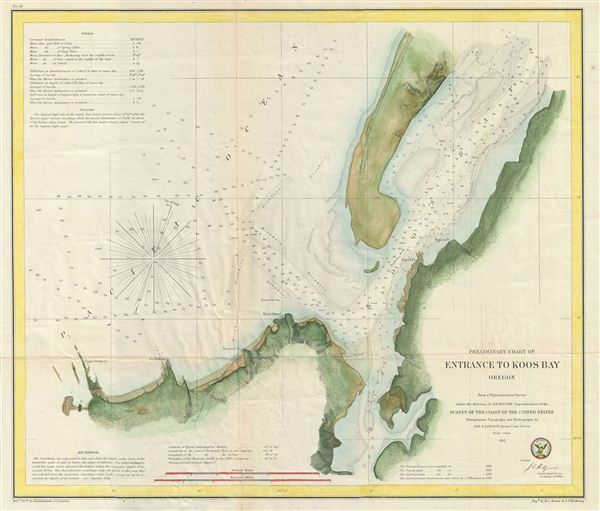 An uncommon 1862 U.S. Coast Survey nautical chart or maritime map of Coos Bay (Koos Bay), Oregon. The map covers the entrance to Coos Bay from Cape Gregory to South Slough and north beyond Pigeon Point along the Coos River. The map offers fine detail both along the coasts and at sea with countess depth sounds, notes on lights, rocks, and breakers, and some topographical detail. Notes on tides appear in the upper left quadrant. Notes on sounding are located in the lower left. The triangulation, topography, and hydrography for this chart were accomplished by Jas. S. Lawson. The scale is 1:20000.